Once again, for the Photo of the Week I’ve chosen the picture that is #1 on my Instagram account, a night shot of the portales in San Miguel de Allende, where I live. These arched and covered sidewalks run alongside the Jardín Principál, the main central plaza in San Miguel. I was not prepared for this shot since I had no tripod with me. I was walking home one evening after a dinner with friends when I saw the lights all glowing on the old cantera stone arches and knew I had to take this. I backed up to the wall of a building on San Francisco, braced the camera flat against the wall, held my breath to minimize camera shake and clicked the shutter. It was a pretty long exposure and I had no idea if it was going to come out sharp or shaky, but I was pleased with the resulting shot. When I first came here in 1989, the portales in San Miguel and the Parroquia were not lit up at night. Nor were the streets surrounding the Jardín closed off to traffic. Both these changes have added so much to the aura of the centro. 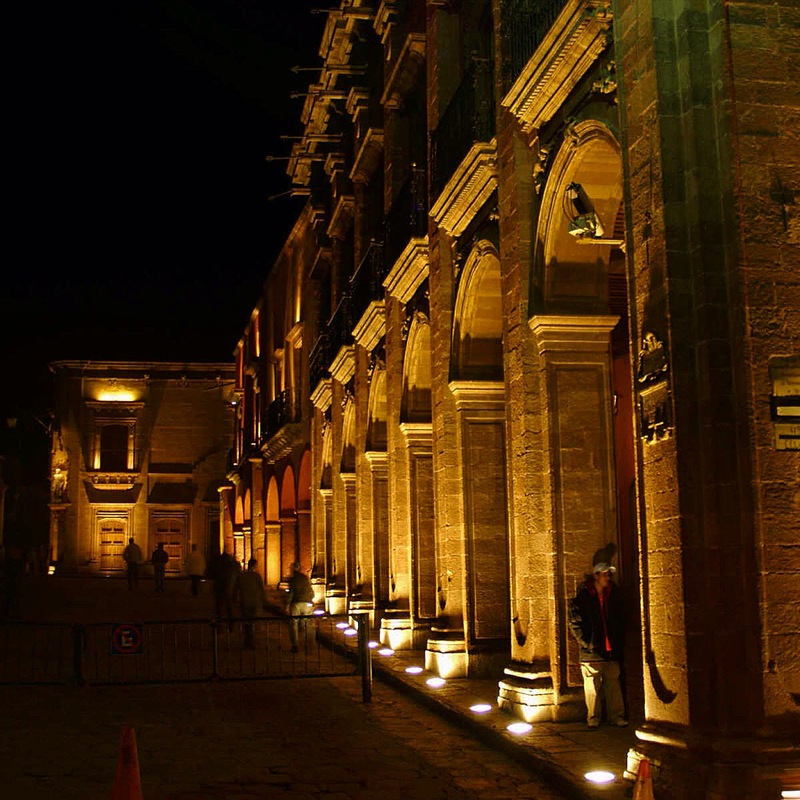 The portales in San Miguel de Allende glow beautifully in the lighting the city has installed, highlighting the details on the 18th century cantera stone buildings. The portales in San Miguel are in a very traditional style you see all over Mexico, a remnant of Spanish colonial style. They serve many purposes besides looking elegant and inviting. These graceful covered passageways shade you from the hot sun or protect you from the monsoon downpours in the summer rainy season. In San Miguel, it’s not unusual to see a crowd huddled just under the edge on a rainy afternoon, peering out at the torrents running down the streets—which turn into real rivers, like “kayak-needed” rivers—waiting for the storm to pass. Fortunately, the downpours seldom last long. Then the sun comes out, the water runs off quickly, and the streets dry up. San Miguel is its usual sunny and beautiful self once more. Nowadays, the spaces have gone upscale and touristy. Those small, practical mom-and-pop stores can no longer afford the rents that being here command. The portales in San Miguel now harbor mostly sidewalk cafes and boutiques. The Café del Portal, on the south corner with a superb view of the Parroquia, is a nice spot for a coffee and dessert. You can get a great Parroquia photo by using the arch of a portal as a frame. On the opposite side of the Jardin, Rincón Don Tomás is a popular spot with locals to meet for coffee or lunch, catching up and people watching. Just a few doors up, visit El Bazar del Angel, a boutique owned by local writer and radio personality Yolanda Lacarieri. She has a well-chosen collection of jewelry, beautiful scarves and rebozos, San Miguel shoes, hats and San Miguel gifts, including the whimsical hand-painted tin nichos with funny calaca tableaux inside by Estudio Cielito Lindo. The building at the northwest corner of the Jardín, in the very front of the photo, was once the town home of the Counts of Canal, one of the most important families in San Miguel in the 17th and 18th centuries. They also, of course, had a country home, a huge hacienda with thick walls of gray stone. Now I don’t know about you, but I usually think of a “country home” as being, well, in the country. I suppose at one time it was, but the beautiful and graceful building, with its elegant central patio, interior arcades and a small family chapel, now houses the Instituto Allende art and language school. And it is a 15-minute walk from the Jardín and the family’s “town” house under the portales in San Miguel. It probably took less than 10 minutes on a horse all those years ago, even without much of a road. When you visit San Miguel de Allende, make sure to take time to wander up and down the portales in San Miguel and feel like you are back in colonial times, with all the elegance that entailed. I am loving posting photos on Instagram every day, and I think the process has really sharpened my eye as a photographer. Have a look at my Instagram feed and let me know what you think in the comments below. Wonderful photo! I love how everything is all lit up at night. It’s hard to get good looking night photos, but you really captured the spirit of it here! Oh I love good night shots so muich! That and great architecture, 2 things you captured here. Mary recently posted…The Canary Islands: which one would be your pick? Great photo! Glad you were still able to capture it so well without a tripod or anything–that can be so frustrating! Looks like a really pretty spot! Beautiful! I love night photos and love taking them too, especially buildings with characters and ones that are beautifully lit up. Just beautiful, my husband and I were just talking about San Miguel earlier today. Looks like its time for a trip! Holding the camera against a wall was a creative approach and it worked beautifully! Great shot! I’ll have to try that next time because it’s so hard with long exposures. Great post and beautiful writing to accompany it!! City night shots are stunning – I love the light in this one. Nice work! Actually Lynda, it was exactly that, idyllic, and precisely the kind of evening I needed at that moment. Thanks for the comment! i’ve said it before and i’ll say it again (and again): i am so jealous of where you live! what a stunning city! HaHa! You have to come visit! I will be happy to show you around. It is, indeed, stunning.